Strong defense and an effective running game were the ingredients that guided the 2010 Wood River High School football team to two season-ending victories and the school’s first .500 season in 10 years. Wood River (4-4) ended its break even campaign with a convincing 21-6 Great Basin Conference win over the Canyon Ridge Riverhawks before an appreciative home crowd at Phil Homer Field Friday night. Under a bright Full Hunter’s Moon, the Wolverine defense was the aggressor and the Riverhawks’ air attack the prey. The defense won the confrontation, blanking the ‘Hawks after half and allowing one touchdown, that coming with no time left in the second quarter. 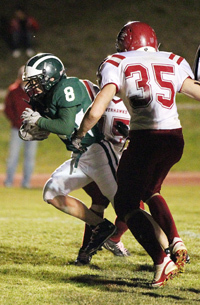 The week before, Wood River built a 27-6 lead and won 27-20 at Burley. The two triumphs were similar in that the Wolverines limited mistakes, grabbed early leads and relied on defense and special teams. In Friday’s “Senior Night“ and “Pink Out” game, Wood River out-rushed Canyon Ridge 247-124 and owned a 28-20 advantage in time of possession. The Wolverines committed two turnovers, to the Hawks’ six. Wolverine junior running back Greg Lindbloom (20 carries for 113 yards) scored his first touchdown and provided only the second 100-yard rushing effort by the Wolverines this fall. Senior fullback Nathan Farrow (8 carries, 57 yards) scored two TDs. Carving the holes was the offensive line of center Alex Thomas, guards Jake Vegwert and Ben Williams, tackles Kevin Cooley and Isaiah Garza, and end Connor Braatz. Senior quarterback Kevin Jensen returned to guide the offense effectively. He bravely played the second half with a heavily taped ankle. Lindbloom (9 tackles) along with defensive captain Kasey Barker (6 tackles) and fellow linebacker Farrow (6) sparked a fierce Hailey defensive effort. Canyon Ridge committed six turnovers, three of its lost fumbles caused by hard hits. “Our defense played well again,” said second-year coach Kevin Stilling, whose patience helped the Wolverines improve from 2-6 to 4-4. Wood River’s secondary featuring Lindbloom, Ryan Chapman, Alex Padilla and Braxton Parish did a great job holding Canyon Ridge’s hard-throwing 6-3, 205-pound senior quarterback Tyler Meyers (12-of-39, 138 yards. 2 interceptions) to 11.5 yards per completion and no aerial TDs. Chapman in particular was effective batting down passes without incurring penalties. Drew Barsch (interception, fumble recovery) and KJ Savaria applied pressure from the ends. Barker and Farrow stunted from their linebacker spots to flush Meyers from the pocket and hurry his passes. Stacking up the ‘Hawks line were defensive linemen like Ben Williams, Jake Vegwert, Jimmy Williams, Kevin Cooley and Willy Dugger. “We put just enough pressure on Meyers and our defensive backs did a great job—staying over the top to prevent anyone from getting behind them,” said Stilling. The longest ‘Hawks pass completion, 48 yards, came from a short pass and run in the middle. “Meyers was a very good quarterback who presented a lot of different formations and got some yards rushing. But we tried to recognize what he was doing and keep it as simple as we could for our defensive players—so they could play aggressively. And that’s what they did,” said Stilling. It was Wood River’s third home victory in four home games this season, quite an improvement over last year’s 0-4 home mark. By placing fourth in the six-team league, the Wolverines missed the playoffs but improved their scoring by a touchdown per game and cut their defensive liabilities by 11 points a game. “Winning our home games was a big thing and our fans were a tremendous support,” said Stilling, whose 2009 team was outscored 188-36 in its four home losses but only 75-67 in winning three of four games this fall. Barker (36 yards average, 5 punts) booted a monster 69-yard punt at Canyon Ridge last year that dictated field position for most of the second half on a rainy night—and Wood River won its finale 9-8 on a Nathan Farrow TD and a game-winning 31-yard field goal by Haylee Thompson. Field position played a big role for the Wolverines Friday as well. Canyon Ridge started its fourth-quarter drives at its own 29-, 14- and 5-yard-lines. After an eight-play, five-minute Wood River drive killed off a good part of the fourth, Stilling called on Barker to pin down Canyon Ridge with a coffin corner punt. Stilling stationed someone at the ‘Hawks five-yard-line so Barker could have something to aim for. Barker angled a punt so accurately that it rolled out-of-bounds exactly at the five—easy as that. All Meyers could do from there was toss five incomplete passes and move the ‘Hawks only to the 25, that on a pass interference call. Starting after the “Senior Night” ceremony, Wood River got off on the right foot by scoring on its first possession for the fifth time in eight games. “That’s a huge improvement for us,” said Stilling. Alex Padilla’s 60-yard kickoff return helped greatly by a Willie Dugger block put the Wolverines in business at the ‘Hawks 31-yard-line. Farrow finished the TD drive rumbling through a huge hole for 18 yards and a 7-0 lead after Haylee Thompson’s extra-pointer. The first decisive play came with Meyers and the ‘Hawks mounting a serious drive on their first possession to the Hailey 15-yard-line. There, Farrow and Barker crunched junior Braydon Metcalf, who fumbled. Dugger alertly recovered. Different defenders made big plays all night for Wood River. Late in the first, the defense made three stops for losses. KJ Savaria fought off a blocker and corraled Nick Kytle (11 carries, 48 yards) for a three-yard-loss, Barker sacked Kytle from the backside for a seven-yard loss on a halfback pass, and Drew Barsch sniffed out a screen pass for a four-yard loss. The developments forced Meyers to punt, but he shanked it and Wood River went to work at the ‘Hawks 44. Trace Tupper (5 carries, 51 yards) took a pitch for 10 yards, Farrow found a gaping hole off left tackle for 15 more, then Farrow broke tackles on 12-yard and 4-yard runs, the last one for his second TD. Barsch’s fumble recovery on Canyon Ridge’s next attempt gave the ball to Wood River at midfield—where Tupper sprinted for 26 yards on a fake reverse. Farrow rambled for nine and Lindbloom for 10 more. From the four, his legs always churning, Lindbloom burrowed through the bigger boys for his touchdown, 21-0. Canyon Ridge may not have scored at all, if not for a determined run by Meyers (9 carries for 66 yards). The ‘Hawks turned a Zaki Abdul fumble recovery into their best scoring chance—Meyers scrambling for a 16-yard fourth-down gainer to the Hailey 15. On first-and-goal, Chapman broke up back-to-back slant passes. Meyers had one play left at five seconds and ran around right end. Fully extended, he dove for the end zone as Padilla tackled him. Padilla didn’t think Meyers made it into the end zone but the official did.It made the score 21-6 at half. Canyon Ridge opened the second half driving to the Wolverine 15-yard-line before big Ben Williams sacked Meyers from behind on a big pass rush. Meyers fumbled and Williams recovered. Then, on the next ‘Hawks try, Lindbloom and Chapman gang-tackled Kytle on a fourth-and-nine aerial inside the Wolverine 20-yard-line, incomplete, ending a threat. Their chances of sustained drives dwindling, the ‘Hawks managed only 27 yards rushing after half and relied on Meyers’ strong arm—but too many of his passes missed their target, were dropped or were batted away by Wood River defenders. Check today’s Web site for game statistics, and the Nov. 10 Local Life section for more game photos. WOLVERINE NOTES—Wood River’s 2010 taco bar football banquet is Wednesday, Nov. 3 at 6:30 p.m. in the high school commons area. Be sure to RSVP no later than Friday, Oct. 29 to Shannon at 471-0333 (Shannon.Thomas@cox.com) or Ruth at 720-2970 (ruth@morgansff.com). Rushing—Greg Lindbloom 20-113, 7 1sts, 1 TD; Nathan Farrow 8-57, 2 1sts, 2 TD; Trace Tupper 5-51, 1 1st; Alex Padilla 4-32, 1 1st; Kevin Jensen 6-3; Braxton Parish 5, -9. Passing—Kevin Jensen 0-2, 1 interception; Alex Padilla 0-1; Trace Tupper 0-1. Fumble recoveries (4)—Ben Williams 2; Drew Barsch 1; Willy Dugger 1. Interceptions (2)—Alex Padilla 1 with a 7-yard return; Drew Barsch 1. Sacks (3)—Kasey Barker 1-7; Ben Williams 1-7; Nathan Farrow 1-9. Tackles (50)—Greg Lindbloom 9, Kasey Barker 6, Nathan Farrow 6, Ben Williams 4, Alex Padilla 4, Willy Dugger 4, KJ Savaria 4, Ryan Chapman 4, Drew Barsch 3, Braxton Parish 3, Jake Miczulski 1, Jake Vegwert 1, Tyler Bartlett 1. Rushing leaders—Tyler Meyers 9-66, 3 1sts, 1 TD; Nick Kytle 11-48, 3 1sts; Sawyer McMillian 2-10. Passing—Tyler Meyers 12-39, 138 yards, 7 1sts, 2 interceptions. Receiving—Colton Sweesy 5-82, 3 1sts; Nick Kytle 3-40, 3 1sts; Derek Bastian 3-11, 1 1st; Nathan Sterner 1-5. Fumble recoveries (1)—Zaki Abdul 1. Sacks (2)—Derek Bastian 1-7; Sean Hughes 1-0. Kickoff returns—Sayer Conrad 2-31; Nick Kytle 1-29; Colton Sweesy 1-18. Punt returns—Nick Kytle 1, -8. Tackles leaders—Nick Kytle 8, Sean Hughes 7, Colton Sweesy 4, Igor Jozlic 4, Sawyer McMillian 4, Braydon Metcalf 4, Derek Bastian 3, Chase Smith 2, Siyavosh Askari 2, Burhan Hetemi 2. Note: Haylee Thompson had a 29-yard field goal. Touchdown passes—Kevin Jensen 2, Connor Braatz 1. Conversion passes—0. Notes—Wood River scored in 15 of 32 quarters....Wood River successfully made 15 of 17 conversions (88% success rate)....Wood River scored 17 TD—12 on runs from scrimmage, 3 on passes, 1 on kickoff or punt returns, 1 on defense.